Although most people are very familiar with moles, not everyone fully understands its underlying cause. In this article, we'll let you know if there's a link between cancer and mole, how to identify cancerous moles, and tips on how to make your moles less noticeable. 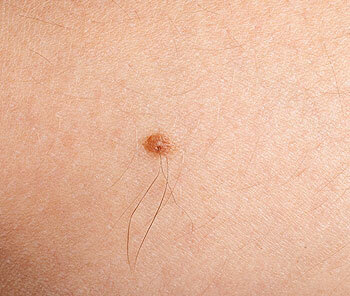 Mole and Cancerous Mole - What's the Difference? There are a lot of myths surrounding skin cancer and moles. Some people say that moles in the palm of the hand and soles of the feet may be cancerous. Others say that removing the mole hair can make it cancerous. In many cases, these myths came from the idea that you will most likely get cancer when stimulation is applied on the mole area. However, it is unlikely that you will get cancer just by actual stimulation. 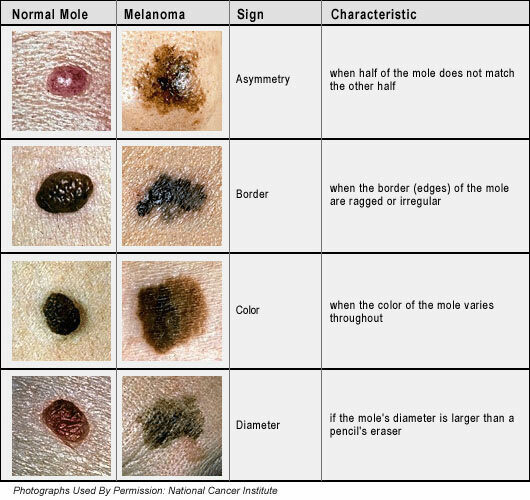 In addition, there is very little evidence that shows that mole is a type of skin cancer in the first place. Moles are essentially benign tumors that contain nevus cells (a type of cell that produces melanin pigment), which may be congenital or grows for some reason. These melanin-producing cells (melanocyte) can only be considered cancerous or malignant if they are characterized by uncontrolled or progressive growth. In other words, cancer and mole shouldn't be linked since they are completely different. One way to tell whether the dark pigmented spot in your skin is a mole or a cancer is by looking at its regularity. Cancer, by its nature grows uncontrollably and irregularly. This is a complete opposite from mole. In fact, there's symmetry in the structure and shape of normal moles. However, a bumpy and uneven color, and increasing size of the pigmented spot can be an indication of cancer. In addition, if a hair grows in the dark pigmented spot, then this is a solid proof that it is a benign mole and NOT a cancer. This is because a malignant mole or cancer destroys the skin pores and prevents hair from growing. TRIVIA: Did you know that mole hairs tend to grow longer than other hairs in the area? This is due to the fact that capillaries of a mole are growing rapidly and excessively, and this includes the hair follicles. There are now treatments available that can remove moles. These are the traditional surgery (excision or shaving) or the newer laser methods. The treatment method that will be used will depend on the location and size of the mole. Generally, large moles are removed surgically, while smaller moles can be removed through the use of laser. Nevertheless, neither of these two treatments is painful once the affected area is subjected to anesthesia. With that said, keep in mind that removal of mole is not a 100% cure. In fact, about 30% of people who receive treatments experience a relapse. There are also mole-removing creams that are available in the market. However, this DIY-approach of removing moles is not recommended and is very risky. The use of eye-catching colors, such as yellow, red, and orange, can help make your mole unnoticeable. You can adopt it with your makeup, lipstick, necktie, scarf, and eyeglasses. Experiments show that people are more likely to be attracted to these eye-catching colors and distract the eye from the mole. Have a Mole? Don't Do Anything at All! Studies have shown that most people do not mind a person's mole most of the time. That is, even among friends, parent and child, it was found that even in close relationship, people can't remember the location of moles of the other party. However, if you find your mole to be related to melanoma, which is a serious type of skin cancer, we highly recommend the use of the PYRO-ENERGEN electrostatic therapy for treatment and prevention. Read article "PYRO-ENERGEN Treatment Against Cancer".